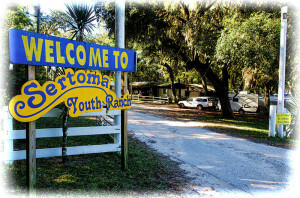 The Sertoma Youth Ranch was born in 1973 when a state policeman, an insurance agent and an auto parts store owner met during the Sertoma regional conference. In that hotel room Jim Foster, Ralph Chancey and Jesse Brown hatched the idea of a youth ranch for boys to enjoy a natural, rustic, outdoor environment. Initially called the Sertobo Youth Ranch, it was later changed to the current name and included all youth at no charge. An extensive search began. The current heavily treed, 62.5 acre property with a small lake was found and negotiations began. The owner liked the idea of using his property to develop a place where children could come and enjoy the outdoors. The agreement was $8,000 down and deferred payments for one year on the remaining $60,000. With a leap of faith, Jim Foster and Jesse Brown made the down payment and hoped that they would recoup their money and be able to raise the rest of it. Sertoma Clubs in the Central Florida District were contacted for their help. An army of volunteers went to work with chain saws and lawn mowers, hauling them down a washed out road to clear and clean the property before it could be used for anything. The owner died six months later and Sertoma was contacted by his estate. Since no payment arrangements were made, pay what you can was established. To generate some income, a few water and electric RV sites had been installed. An attempt at country and western concerts were held without much success. Board member Steve Ditman knew that there was a strong following for bluegrass, but the first few concerts did not cover the band fees. However, the participating bands liked the youth ranch concept and accepted what we could pay on the condition that they would be asked to return. Over the years other Sertoma clubs joined, and prominent Sertoman Gilbert Turner donated and installed a 30×60 pavilion. A stage was added and more RV spots installed as the events got better attended. A mortgage burning party was held in the late 80’s. To provide more volunteers and to better support ranch activities, the Ranch Hands Sertoma Club was formed in 1991. Danny Schadt was the charter president of the Ranch Hands and a longtime member of Tampa East Sertoma Club. The Ranch Hands also host four special event days each year for handicapped children and adults with lunch, music and hayrides for all. The Christmas event has Santa arrive on a tractor to the delight of more than 100 children. This club and many others continue to be a vital part in supporting the ranch and its mission. Improvements continue at the Ranch. An additional 20 acres were added for primitive camping. The Bluegrass Café, Soggy Bottom Pavilion, children’s playground, bunk house for rent, shower facilities and a deeper well, were all added over the years. Challenges that exist for the future include: moving the playground and upgrading the septic system along with new restrooms that are needed near the Bluegrass Café. One of the Ranch’s main source of income is derived from the annual Thanksgiving Bluegrass Festival. This tradition has been taking place since 1979. This is the only festival where 100% of the proceeds go to the Ranch. We are open year round, so camping on a non-event weekend is our monthly source of income. We also derive our income from leasing out the park to promoters. The Ranch remains free of charge for any organized youth group to enjoy the beauty of Florida’s natural environment in safety. The Sertoma Youth Ranch is a living example that great things can grow from the simple ideal of Service to Mankind – Ser to Ma – Sertoma! Soggy Bottom Bluegrass Group – Their monthly picking, grinning, and donations at the ranch help sustain programs for the children.